The film’s story is about young Pushpa, an accomplished dancer and singer, who assists puppeteer Shivraj in his puppet show. Pushpa comes from a poor family, and is a good dancer and singer. She would like to assist a puppeteer with his makeshift dolls and puppet act. Unfortunately, he meets with an accident, and is hospitalized. Some of his puppets were also damaged during this accident. 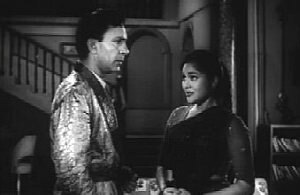 Pushpa approaches Loknath for work, and he gets her to work on stage, and would like her to become a movie star. Will Pushpa give up her simple life, and take on the glamorous route? It dealt with the theme of a godfather trying to control his protégé.